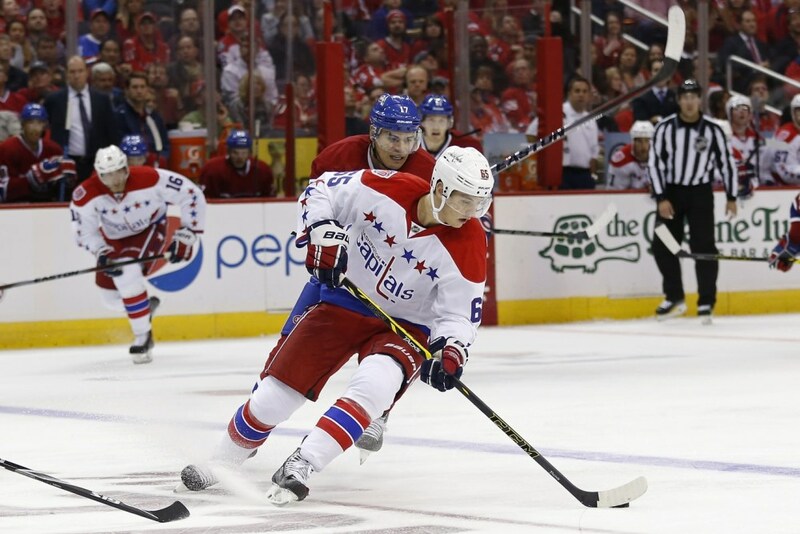 Capitals Sending Marcus Johansson a Message? If Marcus Johansson played for another team, let’s say the Detroit Red Wings for instance, the soon-to-be 25-year-old forward coming off his best year likely would be considered as one of those homegrown young talents the Wings would plug in for the next five to seven years to play a key role in helping continue that franchise’s impressive streak of playoff appearances. When you consider his career-best 20 goals, 47 points, 82 games played – along with possession and shots metrics that far surpassed anything he had recorded in the past – what’s not to like about those numbers from a player who still has yet to enter his prime? But based on how the recent contract negotiations between Johansson and the Washington Capitals played out, paired with some of General Manager Brian MacLellan’s recent comments, there seems to be at least a little bit of doubt among Washington’s braintrust when it comes to Johansson. Or perhaps the entire process was part of a motivational ploy to get more out of the speedy Swede. The knock on Johansson over the years has been a lack of consistency – consistency of effort and production over an entire season. His speed and skill leave coaches and fans wanting more, and his flashes of brilliance have caused many to ask, “Why can’t he do that on a regular basis?” Yet, until last year the consistency over a full 82 games on both ends of the ice had been lacking. And while there’s no doubt that last season Johansson took major strides in terms of consistency, turning in his most productive all-around season, there was a drop off in production toward the end of the year. And then there’s the one goal and three assists in 14 playoff games, bringing his career totals to just 5-10-15 in 44 career postseason contests. Still, his career-best offensive numbers, along with a career-best +6 rating (following a dismal -21 the year before) and improved analytics, have him trending in the right direction. Considering Johansson’s improved consistency, impressive skill set and relative youth, you might think the Caps’ brass would be inclined to give Johansson, who was a restricted free agent this summer, the type of deal that would keep him in D.C. through his prime. While MacLellan admitted he was interested in signing Johansson to a long-term deal, the $3 million the team offered was hardly the type of money that would make a maturing player who should be approaching his best years want to sign for three or four years. Likewise, the $4.75 million Johansson and his agent sought was probably too high a number for a team that was up against the salary cap to commit over the long haul for a player who still has much to prove. So the negotiations went to arbitration, and the predictable middle-ground mandate of $3.75 million for one year means that Johansson and the Caps will go through this process again next summer. There’s little doubt that Johansson and his agent knew that $4.75 million was out of the question, but why not shoot for the moon? The hope from their side was probably a three- or four-year deal starting at around $4 million a year. Of course Washington had the leverage, knowing that an arbitrator would most likely make the two sides meet somewhere in the middle with the team still holding his rights after the 2015-16 season. But maybe there’s a little more to it than that. Perhaps the team thinks there’s more inside the quiet young Swede than even he realizes. The relationship between Johansson and the Caps bears a striking resemblance to the relationship between 1980 U.S. Olympic hero Jim Craig and head coach Herb Brooks as portrayed in the movie Miracle. Who can forget the scene in which Brooks, a master motivator, tells Craig that he won’t be the starter for the Olympic opener after the Americans had dropped a 10-3 decision in a final exhibition against the Soviet Union? Going back to his first postseason comments after the Rangers eliminated the Caps from the playoffs in May, MacLellan spoke about the need to find a top-six wing via trade or free agency and his expectation for impressive youngsters Evgeny Kuznetsov and Andre Burakovsky to hold down top-six forward spots for the coming year. Then MacLellan went out and signed veteran playoff producer and Stanley Cup winner Justin Williams before trading for talented winger T.J. Oshie. Following the signing of Williams MacLellan said he envisioned the veteran being a great fit with Kuznetsov and Burakovsky and being able to help them mature. Then came the deal for Oshie, a top-six guy his entire career. Do the math or read between the lines or whatever you need to do, but that clearly leaves Johansson on the outside and looking up at the top six. Mind games? Perhaps? Don’t forget that Burakovsky has just 53 games of NHL experience, so his emergence as a true night-in, night-out top-six forward next year is not a slam dunk. But his 22 points in those 53 contests, paired with an impressive showing in the playoffs after Eric Fehr was knocked out with an injury, showed both the type of promise and growth that would make anyone think his ultimate role in the NHL will be as a top-six forward. Between MacLellan’s comments and Burakovsky’s emergence, Johansson has to see the writing on the wall. If he wants to maintain or improve his numbers and be considered a $5 million-a-year player he’s going to need to get top-six and power-play minutes in 2015-16. For that to happen he’s going to have to come to training camp ready to give his best effort and be consistent in all three zones. Of course MacLellan has softened his comments a bit since the arbitration ruling was handed down, saying that he expects Johansson to compete for top-six minutes and to return to the team’s top power-play unit. The carrot has been dangled and the stakes have been communicated clearly now. There’s little doubt at this point that Johansson is poised to have a long and successful career at the NHL level and will make plenty of money. This season will go a long way toward determining whether that will be at an elite, top-six level. Will he rise to the challenge and take another step forward or settle into a bottom-six role? It should make for an interesting training camp, and if MacLellan’s tactics get the most out of both players, it could be quite a season in D.C.